When you make your way from Kottbusser Tor down to Hermannplatz, you’ll get Kreuzberg as you imagine it to be: Loud, busy, weird and colorful. You pass Doenershops, Spaetis, and stores that sell so many cheap and unnecessary things you start questioning what they actually make their money with. If you walk straight down Kottbusser Damm, you wouldn’t necessarily guess that one of Kreuzberg’s most beautiful “Kieze” is just to your right. But as usual in Berlin, you can just turn around one corner and the whole scenery turns upside down. The Graefekiez won’t be your new go-to hotspot for activities after nightfall, due to strict noise regulations after 22h in this neighborhood. However, all its lovely cafes, delicious restaurants, cute little shops and streets where one beautiful old building stands next to the other, make Graefekiez the perfect destination for a relaxed ‘lil Saturday or Sunday afternoon excursion. 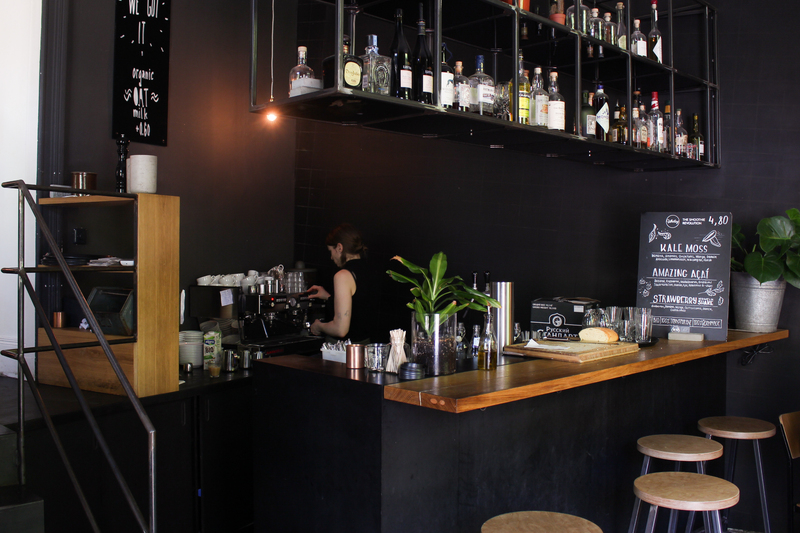 We picked a few spots that you should definitely check out. First things first, on a sunny day in Berlin you have to find a piece of grass, lay down and glare into the sun. The area around Urbanhafen is perfect to get your Graefekiez excursion started. Just relax on the grass, or even better, bring your own boat and paddle along with the group of swans who always hang out on the water. 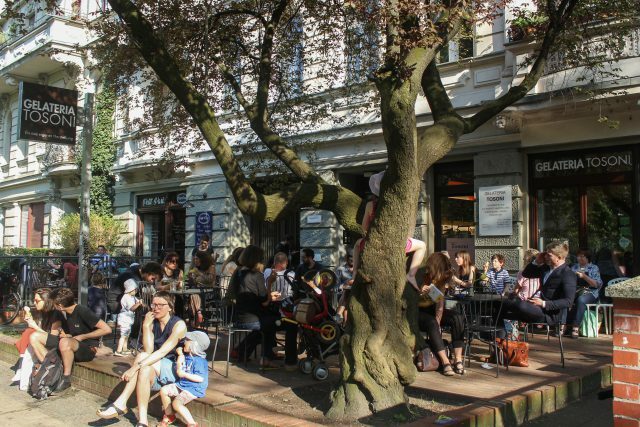 If you do not start your trip through Graefekiez from Urbanhafen but arrive from Kottbusser Damm, make sure you get your first dose of coffee at Kaffee Kirsche. 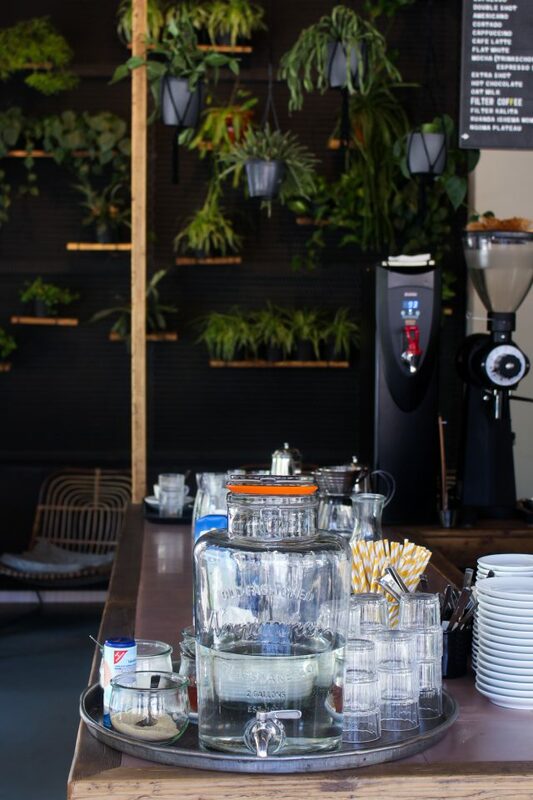 Not only a beautifully designed café where you can drink organic coffee and eat small sweet delights from their own bakery but also an in-house coffee roastery. 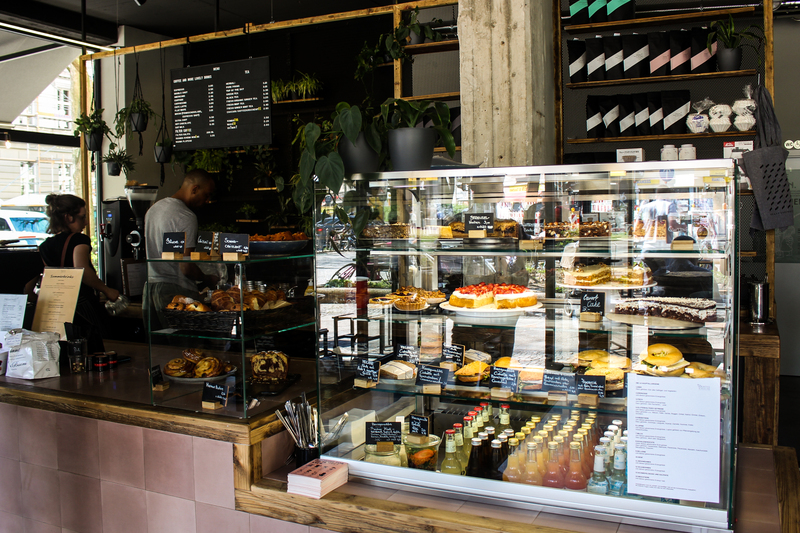 So, you can take their variety of Arabica coffees back home, or you can even buy them online, or attend one of their coffee courses and learn how to do latte art. 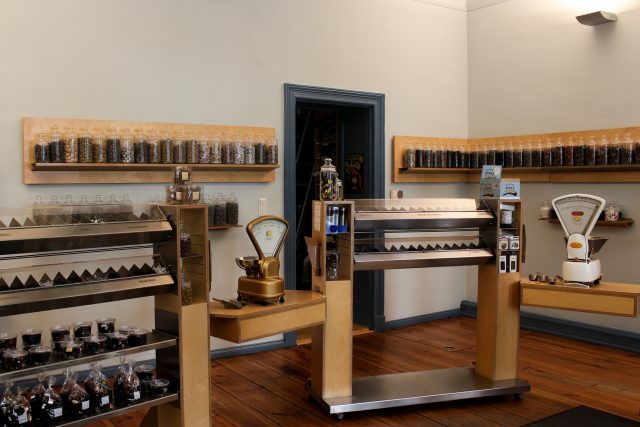 We would call that interactive coffee shop 2.0. Graefekiez is full of cafés and restaurants but this is more than just a culinary excursion. So, after an amazing lunch at Le Bon, let’s go shopping at Moeon. 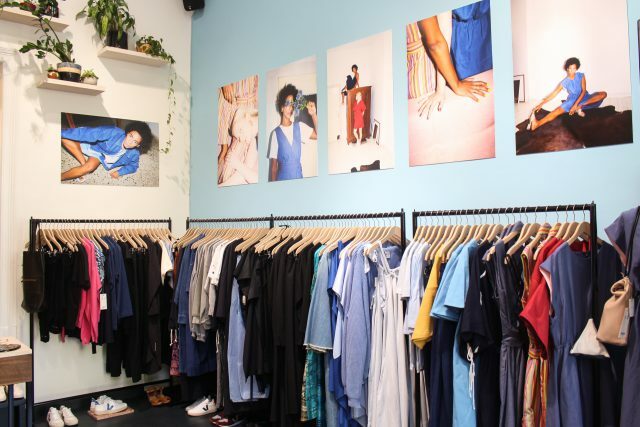 The shop promotes sustainable clothing from various brands and is based in Graefekiez since 2014. The curated selection of products underlines that design and sustainability can go hand in hand. You can also purchase their clothes online. Now, let’s head to the heart of Graefekiez: At Graefestraße our first stop is Kaffeebar because – Is there ever such a thing as too much coffee? Here, sustainability, taste, and cozy design go hand in hand. 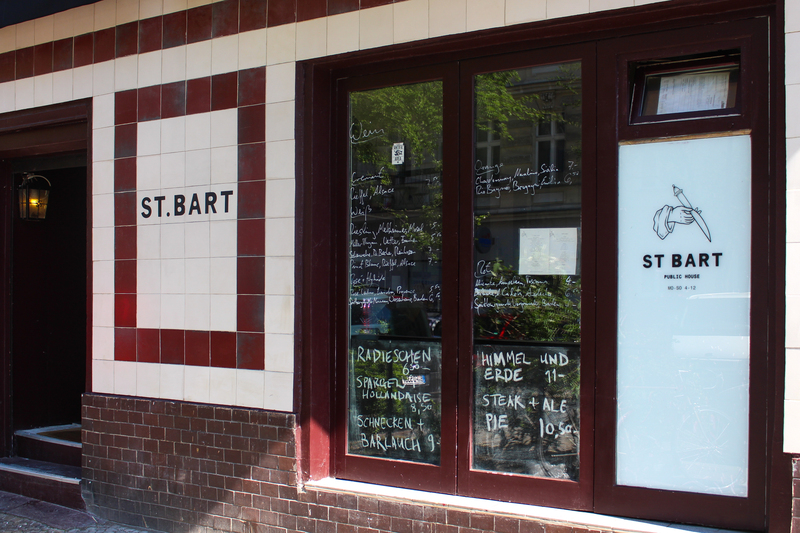 Everything on the menu is organic and homemade, plus, they offer a variety of vegan options, all under 10€. When we hear “beetroot hummus, curry roasted cauliflower & pumpkin, falafel patties, salad, sprouts & seeds + tahini dressing” we don’t quite know what we are gonna get but it sure sounds delicious. If you just walk a few meters down the street, you can get a ball of ice cream at Eismanufaktur. True to their name, they are ‘Ice manufacturers’ serving you delicious flavors like ‘Indian Mango’ or ‘Belgian Cocoa Sorbet’. Eismanufaktur is actually a successful Berlin franchise. If you don’t feel like ice cream on your Graefekiez excursion because it’s one of these rainy, grey Berlin days, there are six more ice manufacturer locations all over the city that you can visit another time. Are you into making discoveries? This little antiquarian bookshop should definitely be on your list then. You never know what you are gonna find in between all of these shelves, boxes, and piles of books and curious things. 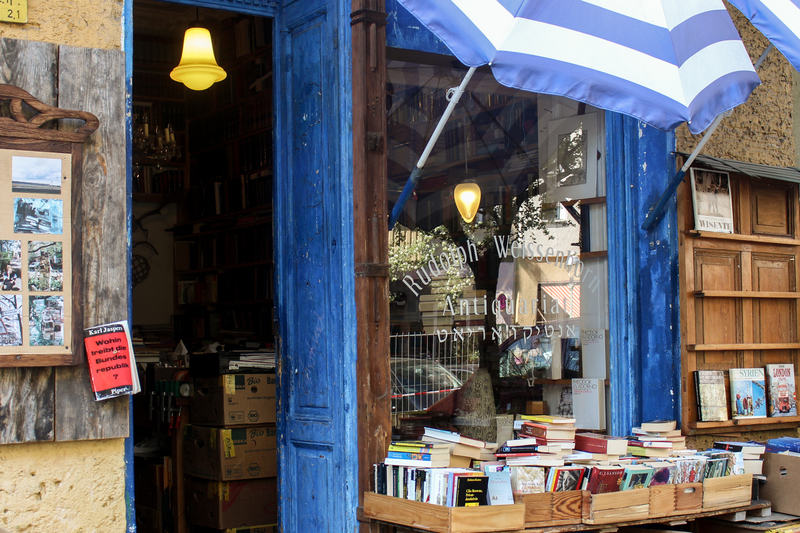 And even if rummaging around is not your cup of tea, this beautifully chaotic place is just adorable to look at. Looking for a place to get lunch or dinner? Just on the other side of the street, there is St. Barth or ‘St.Bartholomew’. It’s a small and unique restaurant with a great menu that changes daily. However, it is possibly not the best place if you prefer to not harm any animals while eating. St. Barth’s loves to put exquisite meat and seafood on your plate. It’s all about the right meal, with the right drink. Sometimes in life, the best things are waiting behind dirty doors and old neon signs. 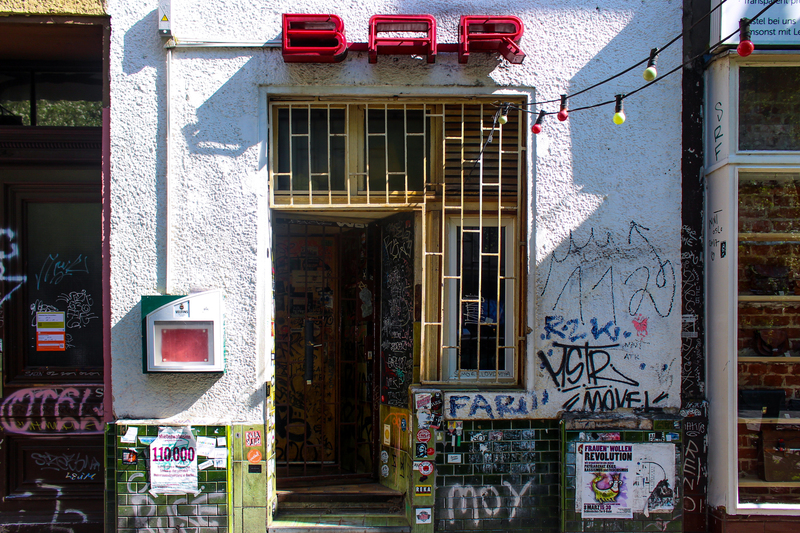 Mini Bar at Graefestraße is infamous as the late-night hotspot of its Kiez. A wild mix of people and music await you behind this slightly unwelcoming door in Kreuzberg. It’s the perfect place to get your night going or to get the last drink before it’s really time to head home. 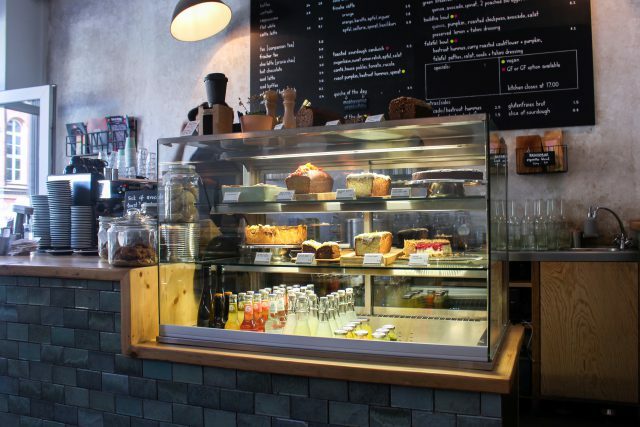 With all the Cafés at Graefestraße, it is hard to pick our favorite. Generally, almost every café in Berlin seems to look like it’s right off the pages of a cozy, interior design magazine. 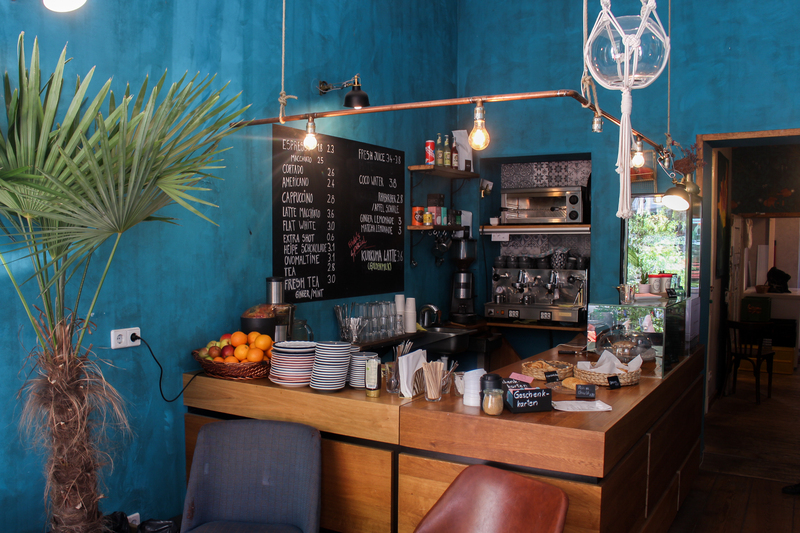 We picked Frida because her bright blue interiors, many different, cute chairs, patterned pillows and the eponymous Frida Kahlo on the wall just invited us to come in, stay and try out one of her tasty looking cakes. Licorice is one of these things that you either love or hate. So, this shop on the other side of the street will evoke very mixed reactions for sure: They are selling nothing but this black, sweet delight out of licorice roots. Kadó was founded in 1997 as Germany’s first licorice specialty shop offering more than 500 different varieties from Iceland or Sicily. There is something for every licorice lover, from sweet to strong and salty ones to licorice wrapped in chocolate or coated in sugar. Be sure, you will find your favorite licorice at Kadó’s. 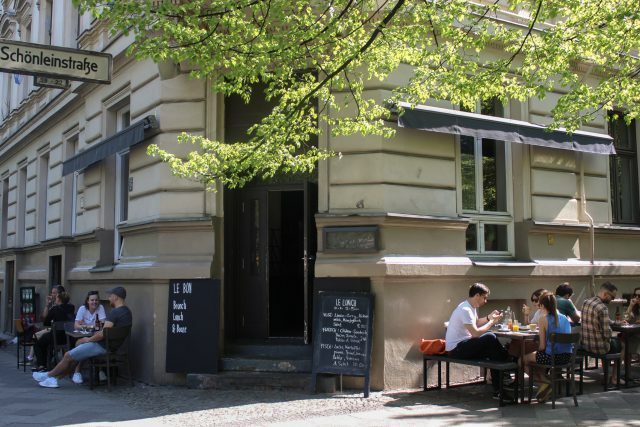 When you make your way down Graefestraße to end your trip with a Spaeti beer at the canal and you have not had ice cream today, maybe it’s your time to pay Gelateria Tosoni at Planufer a visit. The true Italian ice cream shop opened in 2013 and brings 25 years of experience in the field of artisan ice cream making to Kreuzberg. 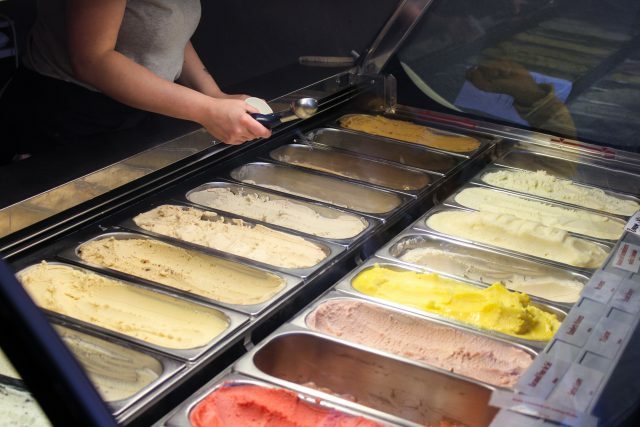 All their ingredients are organic and they offer many tasteful flavors either as sorbets or ice creams. Is there a better way to end a (hopefully) sunny day in Kreuzberg but to sit at Admiralsbrücke with a ball of ice cream or a drink from the nearest Spaeti in your hand and enjoy the scenery? – Probably not! In summer, Admiralsbrücke becomes a social gathering place in the evening where buskers, students. turkish grandpas, young and old Berliners come together to enjoy the sunset. It’s Berlin, you know. Here you can even turn a cobblestone bridge into a local recreation area. And here, in a hopefully beautiful Berlin sunset, our little Graefekiez tour comes to an end. Bye, you guys.